The Dakota State University women’s and men’s indoor track and field teams competed with many standout performances at the Buena Vista Open on Saturday. The meet was held at the Lamberti Recreation Center in Storm Lake, Iowa. For the women’s team, senior Danielle Rowe was tied for first place in the women’s high jump with a measurement of five feet and 4.5 inches. Sophomore Stephanie Uher was tied for 5th, with a jump of 4 feet and 9.75 inches and senior Amber Krogstad placed eighth with a jump of 4 feet and 7.75 inches. The women’s 4 x 200-meter relay team delivered a nice performance (Rowe, Brandi Gau, Uher, and Amy Pheneger) earned runner-up with a time of 1:52.38. 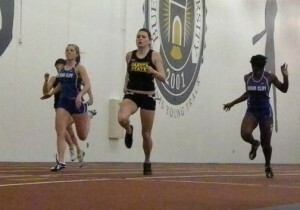 In the women’s 400-meter dash, sophomore Brittany Young placed third in 61.69 seconds. Sophomore Claire Beck was seventh in 1:03.85. Amber Krogstad placed fifth in both long jump (15 feet and 7.5 inches) and triple jump (34 feet and .75 inches). Gau was also sixth in women’s 55-meter dash in 7.99 seconds. Sophomore Laura Porch finished with a time of 30.05 for a seventh-place finish in the women’s 200-meter dash. Sophomore Summer Bronson took 6th place in the 55-meter hurdles with a time of 9.35 seconds. Senior Brandi Gau qualified for the 55 meter dash and finished 6th in the finals. Photo by Matt Fideler. In the throwing events, Brittany Pearson placed fourth in women’s weight throw with a throw measurement of 41 feet and 2.5 inches. She was also 7th in women’s shot put (33 feet and 4.75 inches). 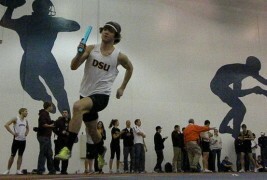 The men’s team was led by sophomore Andy Coy who captured the men’s mile run title. He finished with a time of four minutes and 14.52 seconds, which qualifies him for the NAIA National meet. Senior Phil Carmody and sophomore Stacey Berg were in a three-way tie for eighth place in the men’s long jump with a measurement of 19 feet and 9.75 inches. Freshman Jordy Peterson was fifth in men’s triple jump (41 feet and 11.25 inches). The men’s team 4×200-meter team (Berg, Carmody, Gabe Samuelson and Jared Mengenhausen) placed fourth in 1:36.06. In men’s weight throw, Freshman Shane Whidby threw a measurement of 39 feet and 3.75 inches. Sophomore Matt Glick (unattached) placed fifth with a measurement of 38 feet and two inches. Sophomore Jeff Rieger was sixth (37 feet and 8.75 inches), while sophomore Trevor Rosstznecht was eighth (36 feet and 1.5 inches). This weekend the team will split again as some will travel to Lincoln, Nebraska to compete in the Frank Sevigne Husker Invitational at the University of Nebraska, Lincoln. Others, will be continuing their training over the weekend for the upcoming DAC Conference meet held at Spearfish, SD in two weeks.